Is it finally time to leave the traditional helmet behind? When you think of traditional cycling wearables, you might think of devices and trackers aiming to keep tabs on your progress in the saddle. And when you explore the field of personal safety wearables, you quickly discover it's an area that's largely dominated by discreet SOS devices. But what happens when you merge these two spaces together? Well, you get Hövding – a Swedish company that is leaving behind the conventional bicycle helmet in favour of modern technology. 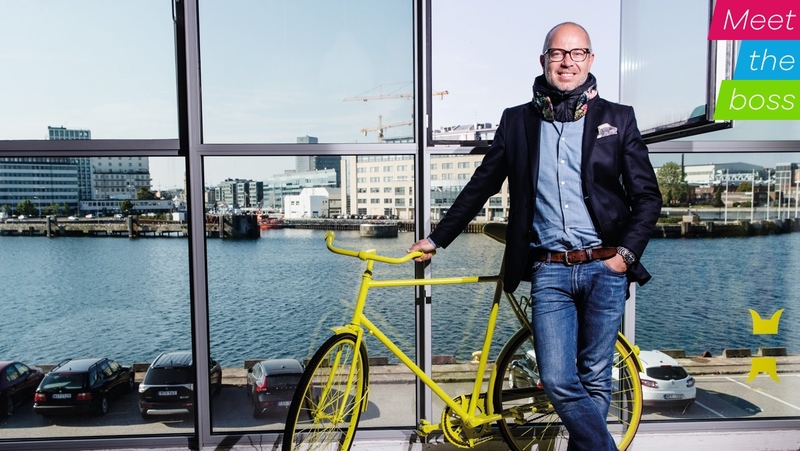 And after more than a decade of developing its scarf-like device and successfully bringing it to cyclists across Europe, Hövding is now cemented as the company to help you stay safe differently. We sat down with company CEO Fredrik Carling to talk through just what the device is, the technology that's keeping 50,000 Hövding users safe on the road and what could be coming in the future. "Back in 2005, there was a discussion in Sweden on whether to introduce a law for people under the age of 15 to wear helmets when they were biking, which was eventually introduced. But there was also a discussion whether that should also include adults, too," Carling told us. "The founders who started this project basically felt that this threatened what they loved about cycling, and that's the freedom, the wind in your hair. And at the same time, the bicycle helmet had not evolved in 30 or 40 years – the way it looked in the 1970s is essentially the same way it looks today. So it was designed from a place of fear. It was designed because of a potential change to the way they cycled and what they loved about it. That's how it all got started." But with Hövding presenting a new behaviour for cyclists when they mount their bike, just how does it cope in the event of an accident? As Carling describes, the process begins when you turn the collar-type device on and kick in its self-diagnostic tests. Once the cables, sensors and processors are confirmed to be in working order, the sensor begins tracking your movement 200 times per second. "[The sensors] understand how your body behaves, and through all the research and re-enacting thousands of accidents with stuntmen and stuntwomen, as well as thousands of hours of normal cycling, we've trained Hövding to understand the difference between movements that are leading to an accident and you just going about your everyday biking. "And in the event of you actually going into an accident – it may be a very aggressive accident, or it could be a more subtle one – it then picks up on those movements, and when it has enough confirmation to know, 'Okay, my buddy here is on his way into an accident', it will inflate. And then it goes from this scarf to a fully protected airbag around your head in less than 100 milliseconds." As is the case with any device promising safety to a user, though, the standards are higher – working just half the time isn't an option, and when it does work, it has to offer stronger protection than the standard helmet alternative. "We're now coming to a place where we're receiving a lot of feedback about the product, and we've documented around 1,000 accidents were it has done exactly what it was supposed to do," Carling continued. "But planes fall out of the sky. Space shuttles go wrong all the time. Nothing is 100%. So for every accident we've had to date, we still have to plan for a situation where the device didn't do what it was supposed to do. On the other end of the scale, what if it inflated and it wasn't supposed to? And by continuing to work on our algorithms, these are the things we want to eliminate completely." Hövding is also looking to understand the future of head protection. In an independent study conducted by Stanford University, it was found to give the wearer up to eight times better protection than a standard helmet does. But despite carving out a space within Europe as a safer alternative, Carling admitted there was no firm timetable to expand to the US, and that the company is looking to establish itself into current markets – such as the UK, Sweden, Germany and Denmark – before going more widespread. "We get a lot of interest, and we will come, but there's no rush. After all, there are as many frequent adult cyclists in Germany as there are in the US, despite the population difference." I have no doubt that, in 20 years, all helmets will be based off this technology. And while it continues to find success in its home continent, Hövding's CEO also alluded to three areas where the company will look towards in the future. "Firstly, we want to make the current functionality even more friendly – smaller, lighter, cheaper, accessible, all those things. But this also includes expanding that functionality. So, for instance, we are now in an EU funded project where we are making Hövding able to communicate over the air with different services, and particularly with relation to safety," Carling explained. "So if you're in an accident and nobody is around, Hövding deploys and a signal goes to a loved one or the emergency services, and unless you stop that within, say, 30 seconds, they're given your geographical location and they can send help." The third route, Carling said, would be focusing on activities outside of cycling, and potentially developing a wearable device for the elderly with poor balance, epileptics or even horse-riders. Like with any strong idea, there also comes the inevitability of imitation. Carling indicated this wasn't a concern, though, with no current competitors in the space and global patents protecting others from developing the same product. "Still, I have no doubt that, in 20 years, all helmets will be based off this technology," he said with a laugh. With Hövding creating a device that's safer and more efficient for the user to wear, it's hard to imagine a future in which the baton isn't passed from traditional helmets sooner rather than later. Hövding 2.0 is available online for £219 or through nearly 600 retailers across Europe.